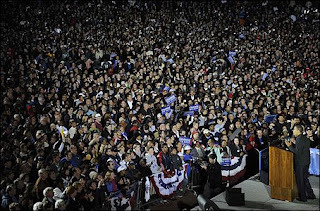 Last night my family attended Obama’s final campaign rally, held here in Virginia. The rally turned out to be a little more involved than I had thought. Getting 100,000 people in a rural fairground will do that. After an hour creeping along the one road in, we pulled into a neighborhood, parked the car, and walked the rest of the way. Two miles. Inside, we waited an extra ninety minutes beyond the scheduled start time for Obama to speak. Afterwards, we had to take baby steps with the tightly packed crowd to get out of the fairground and then, at midnight, walk the two miles back to our car. Along the way we saw that drivers had simply abandoned their vehicles all along the road to the venue. Cars were on the shoulders, the paved walkway, even the median strip as far as we walked and beyond. The verdict is out on whether we were in “real” Virginia at the time. Driving to Manassas, we saw signs proclaiming the area “McCain Country.” Inside the rally, however, I saw the real America that I know in the variety of people and colors and cultures. There on the fairgrounds all people  black, white, Asian, Hispanic, Indian, Muslim, young, old  were doing the same thing. Trying to see Obama through the freakin’ blinding lights focused out on the audience. His speech wasn’t new, but it was inspirational. Even though we were cold and tired, it was exciting to be there with my family making history. But perhaps most important for me in looking around at this diverse crowd was the validation of an inclusive politics. This is where we belong. Change is coming. Hope is here. Wow, that must have been something. Crowds kind of freak me out, so the cars might have stopped me from getting there, but it sounds cool. That sounds like an awe-inspiring night. Hopefully we reap the rewards tonight! And thanks again for being a place where we could all congregate and discuss politics over the past few weeks. This was something that every community needed to be involved in and concerned about! Watching this on the news was nothing like getting your bird's eye view. Thanks for making the moment come so to life! Oh! I thought I saw you there when I was watching the news. How totally awesome that you could go with your family. I took my daughter out of school eight years ago to hear Al Gore speak. Hopefully this election tally will be fair. I wanna be in a swing state! We're so blue nobody bothers with us! I miss Michigan's crazy always-blue-but-will-it-be-this-time status every election, 'cause then at least I'd get to see some of these people in person.